Editor's Note: This story by Ben Brumfield was first published on Research Horizons on Oct 23, 2018. The title was revised for the College of Sciences website. 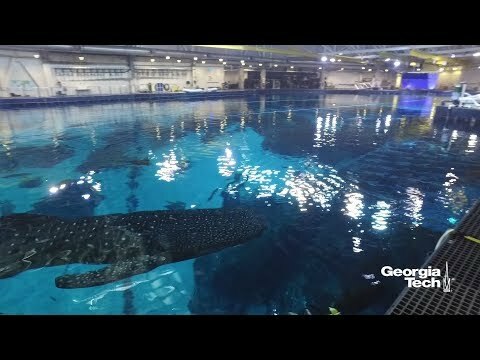 That’s happy news for the thousands of sea fauna, including whale sharks, manta rays and a sea turtle named “Tank,” who live in Georgia Aquarium’s Ocean Voyager, the largest indoor oceanic exhibit in the United States with nearly 24 million liters (6.3 million gallons) of constituted sea water. The researchers analyzed two bacterial communities in the exhibit over time and studied their water cleaning abilities. The researchers would like their continuing work to help aquarium operators everywhere optimize bacterial colonies for maximum water cleansing. Georgia Tech and Georgia Aquarium, a non-profit sea life organization, published their analysis in the journal Applied and Environmental Microbiology on Friday, September, 29, 2018, and Georgia Aquarium share the results with other aquariums and universities near them. First author was Andrew Burns, a postdoctoral researcher in Stewart’s lab. The research was funded by the Simons Foundation, the National Science Foundation, and the Teasley Endowment. To stay fresh, Ocean Voyager’s water cascades through a series of cleaning processes. In the tank, as in oceans, bacteria break down excrement, ammonia and other waste, then the aquarium exhibit’s water flows through filters that remove more things, including nitrites. The water also flows through special bacterial reactors, and by then it’s free from most everything but nitrates, which can become toxic if allowed to build up to high concentrations. In the reactors, colonies of bacteria, the focus of this study, break nitrates down. The reactors, or “pads,” have nearly no oxygen and offer bacteria sulfur as food. So, anaerobic bacteria gather there to “eat” the sulfur and “breathe up” the nitrates to form nitrogen gas, which can bubble up to the atmosphere. Earth’s atmosphere is naturally about 78 percent nitrogen. The bacterial communities the researchers encountered in the two pads they studied dashed expectations. For one, the researchers thought they might find both pads dominated by an iconic denitrifying bacterium called Thiobacillus denitrificans, which can be used to hand-seed professional and home aquariums. They did not. Also, the compositions of bacterial communities in the two pads were virtually each other’s polar opposites. “Even looking at some of the main contributors, there was one genus of Sulfurimonas(bacteria) and even those had a ton of different species, about 150 species or strain variants instead of say, ten, which one might have expected,” Stewart said. Like sports teams, the two bacterial communities assembled different players. One team had one big star player, and the other team spread the skills needed for all the chemical steps across the squad. But it could work the other way around, that particular mixed bacterial communities may work more efficiently, Burns said, and even in systems where one player is the star, variety can add strength. It’s too early to make recommendations, but given the initial observations, the researchers think that anyone trying to optimize bacteria for the aquarium may not necessarily have to throw one great organism into a system from the outside. Coaxing a great bacterial community to self-assemble instead might maximize cleaning power. The Ocean Voyager gallery was built by Home Depot and is one of the largest aquatic exhibits in the world, according to Georgia Aquarium. The exhibit was specially designed to house whale sharks, the largest fish species in the world and also an endangered species conservationist are working to preserve. Georgia Aquarium could possibly have the most aquatic life of any aquarium complex, but that is only part of the non-profit organization’s activities. For example, its animal rescuers save stranded sea lions, and threatened otters and sea turtles. Georgia Aquarium researchers explore the underwater world to expand knowledge needed to protect sea life and habitats, including imperiled coral reefs. And they improve animal care methods to help save and breed endangered species. The following authors contributed to this study: Cory Padilla and Zoe Pratte of Georgia Tech; Kailen Gilde, Matthew Regensburger and Eric Hall of Georgia Aquarium and Alistair Dove of Georgia Tech and Georgia Aquarium. This work was funded by the Simons Foundation (award 346253), the National Science Foundation Advances in Bioinformatics Program (award 1564559), the NSF Biological oceanography program (award 1151698), and the Teasley Endowment. Any findings, opinions, conclusions or recommendations herein are those of the authors and not necessarily of the funding agency/agencies.